This paper was delivered at the conference ‘Contemporary outsider art; the global context’, University of Melbourne, 24 October 2014. Along with many other speakers, I was responding to the suggestion that outsider art is now ‘in’. 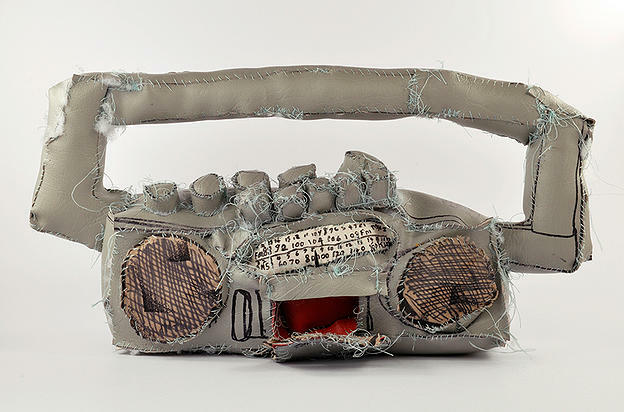 Terry Williams, ‘Not titled’, 2011, vinyl, cotton, Texta and stuffing, 21 x 43 x 14cm. Copyright the artist. Private Collection, Melbourne. Late in the twentieth century, Arthur C Danto spoke of the ‘selective enfranchising’ of outsider artists. 1 Such mainstreaming has ballooned since then. Today, we are in the midst of a collective enfranchisement. In the principal exhibition of the 2013 Venice Biennale, curator Massimiliano Gioni introduced outsider artists, along with mystics and non-artists, in order to ask ‘who has the right to be inside and who has the right to be outside, and also who is really the outsider in the conversation’. 2 Or, as the BBC put it, outsider artists—‘the latest art world fashion’—had been invited to the party. 3 The inclusion of outsider artists alongside those with conventional professional track records is now a feature of grand surveys of contemporary art; for example, the Whitney Biennial (2012) and Melbourne Now (2013). As Lynne Cooke suggests, the outsider is defined from the perspective of the viewer. 4 The incorporation of outsider art into global contemporary art has more to do with the needs of the centre rather than with the claims of the periphery. David McLaglan argues that the twinning of outsider and contemporary art is the latest iteration of an ongoing contrast between the pure and the uncorrupted, outsider art being ‘something like a shadow version or inverted image of the manic promotions of the contemporary art world’. 5 I see that twinning differently; the peculiar conditions of contemporary art now make outsider art a figure of desire. Outsider art no longer represents what contemporary art is not. It represents what contemporary art would like to become. More than a manic market spectacle, contemporary art embodies an historical impasse. Forming in a post-progressive global context, bereft of master narratives and adrift in an atemporal field, contemporary art seeks to reconfigure its critical and resistant capacities. Artists and theorists imagine a renewed progressive culture in terms like ‘imagination’, ‘expansiveness’, ‘the unexpected’ and ‘the impossible’. The title of the New Museum of Contemporary Art’s 2012 triennial—‘The ungovernables’—signals the centre’s renewed desire for a status once accorded to the avant-garde and still held by outsider artists. There is, theoretically at least, no outside anymore. If anything goes, everything is in. In an expanded field, art’s terrain extends indefinitely, its boundaries disappear over the horizon. Declaring a centre is an arbitrary, instrumental exercise; an exercise of power, a naked land grab. The periphery is less distant, in relative terms. In a fluid field, centre and periphery might find themselves adjacent to each other. Of course, certain manifestations of contemporary art are still preferred over others. As curator Simon Sheikh notes, ‘in the current economy of experience, art is expected to deliver the unexpected’. 7 But with museums increasingly shaped by the experience economy; the hallmark of contemporary art is the commodified carnival, epitomised by the sideshow alley installations of Carsten Höller. Danto’s radical expansiveness is subsumed within the figures of surprise and novelty. In this contest between the novel and the genuinely new, between expectation and something that exceeds it, outsider art is a surrogate for the desires of a disenfranchised avant-garde. Outsider art offers the promise of an elsewhere that goads contemporary art to penetrate the horizon of expectation. Critical reflections on contemporary art tend to acknowledge its spectacular forms—ballooning prices, oligarch investors, jet-set events—before seeking to reinvent resistance and renewal within a complex and constrained context. The essential question becomes: Is there a form of contemporary practice that transcends the machinations of a global art market and challenges the cultural manifestations of post-Cold War triumphalism? As curators and critics set about answering that question, outsider art begins to look like a solution, something like what curator Simon Sheikh called a ‘vector of the possible’. Outsider art can embody that metaphor and such aspirations. It is visionary, imaginative, expansive. It sees what others cannot. It usurps or stands beyond limits. It embodies a position beyond the contemporary. And it represents a workable, contained version of Danto’s free for all. It stabilises the extension of art’s frontier. Its expansion is not absolute—it remains relative to the formalised, professional, institutional and social status of the contemporary artist. And yet it is ideal—the outsider’s imagination represents art’s capacity to conceive of other worlds. Outsider art, which already takes its dreams, or nightmares, for reality embodies that imagination. Escaping both spectacular novelty and melancholic lassitude, it is exhibited alongside mainstream contemporary art as an ecstatic affirmation of art’s capacity to be beyond. Outsider art offers the utopian figure of the not-yet; an updated version of Ernst Bloch’s philosophy of hope, which posited that Utopia rested latent within history as a tangible potentiality not yet realised. In more simple terms (and curatorial effects are not always as complex as we assume), the exhibition of outsider art within major contemporary art platforms allows for the thematizing of art’s possibility, of the contemporary’s aspirations, of a curator’s desire for the not-yet. All the more so when the work is an insider’s representation of an outsider’s work, as was the case with Aurélien Froment’s photographs of the work of Ferdinand Cheval in the 2104 Biennale of Sydney. Outsider art, which used to be allowed a family resemblance to aesthetic revolutions (such as surrealism and expressionism), now stands as a benevolent parent to contemporary critical strategies in art. Many of the principal gestures of outsider practice are now mimicked by mainstream artists. Contemporary art turns towards models of world-building as a form of resistance. The formation of social spaces and relations reflects the aspiration towards a space beyond the horizon, towards the not-yet. Contemporary art often models the possibility of other worlds in spatial practices: quasi-architectural environments, installations, architectural interventions, spaces into which subjectivity is invested through process and ritual. Some of outsider art’s classical procedures—fantastic architecture, processional landscapes, monomania, geographical isolation, task-driven practice—now look like a version (a natural version?) of the contemporary. Where modernism took a romantic vision of the outsider as a natural imagination, a visceral or unmediated creative force, the contemporary discovers an ideal form of process in outsider art. Outsider art models a cure for the redolent instrumentalism of the contemporary. But this radical inclusiveness offer no ‘penetration of the horizon of expectation’, no ‘new experiences’. So a globalised contemporary art still searches for versions of the outside. A common trope in contemporary art is the seeking out of marginal, vestigial and pre-modern communities. Preferably these are distant, quasi-folkloric communities shaped by geographic isolation and featuring exotic forms of communication and ritual. (For example, Angelica Mesiti and Joy Gregory’s documentation of the whistling languages of island cultures in separate video installations.) These exemplary realms resist (rather than deny or ignore) the modern, often through a performative culture. The outsider, and especially the outsider environment, is the aestheticized distillation of such pre-global dreaming. Outsider art—especially in its environmental forms—offers the idea of an art of place, locality and subjective experience. Art is connected to site and lived experience. The self is inscribed into locality, often in intense, ritualistic, extended practices. The presentness of contemporary art was once a literal identifier; the contemporary is of the here and now. Now presentness is contemporary art’s albatross. The recent enfranchisement of outsider ort is a function of the dilemmas with which contemporary art is confronted. Contemporary art occupies an expanded field, but fears a world with no outside. It recognises global reach while still craving place. It is caught up in an atemporal hover culture, while desiring vectors of possibility. Faced with such cruel contradictions, contemporary art once again turns to outsider art to exemplify its desires. Outsider art appears untroubled by reterritorialization, unencumbered by a fraught temporality. It is the unexpected, uncorrupted by the experience economy. It is the beyond concretised, the unpresentable that can in fact be presented, at the very centre of contemporary art. Once again, outsider art is everything contemporary art wishes it could be. In its enfranchisement of outsider art, it is possible that contemporary art engages in an intricate begging of the question. Art may be anything and yet one must always know that one is in the presence of art in order to understand the character of this anything. What I have described is a situation in which the Same (the centre, contemporary art) sees the signs of the Other (outsider art) in and through its own desire. The Other is the desire of the Same for its own salvation, what contemporary art would hope to be but knows as the not-yet.